During our recent trip to Dallas there was one place on my radar that I knew we had to check out, this place just happens to be called Medieval Times. I first heard of Medieval Times several years when I watched the movie “The Cable Guy”. There is a hilarious scene in the movie where Jim Carrey takes Matthew Broderick for dinner at Medieval Times and I always knew that this was a dinner show that I had to see one day. 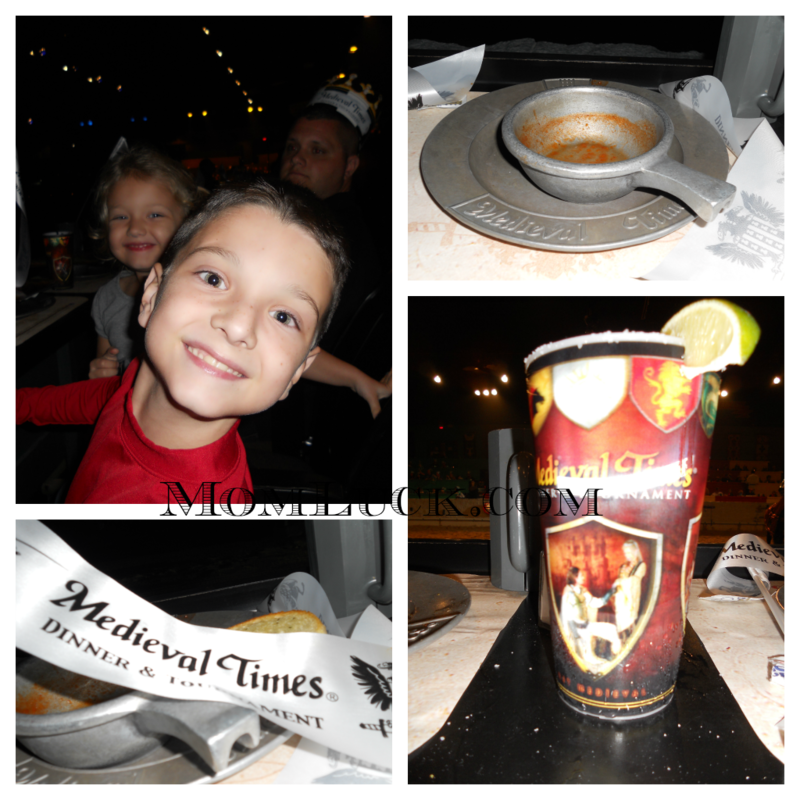 If you have never heard of Medieval Times, your in for a treat! It is a dinner show unlike any other I have ever been too. The show combines the best of both worlds with a delicious dinner and an live action show all at the same time. I attended the show with my husband and two kids, who are ages 4 and 8. I recommend arriving to the show early so that you can get the best seat possible. Seating is first come, first serve so if you want closer good seats plan to arrive early. The door’s open 75 minutes before the start of the show, but their is plenty to do while you wait. You can have a drink at the full-service bar (their drinks are excellent), walk through the museum of torture or just browse through the extensive gift shop. Once your seated the “wench” aka the waitress will come by and get your drink orders. You have two choices between Tea and Pepsi. After drinks are served the show begins. During the show your waitress will come by to fill your plate with a four-course feast that includes garlic bread and tomato bisque soup , roasted chicken, spare rib, potato wedges, and if you still have room a delicious warm pastry of the castle. All of the food has special names such as Dragons blood and Dragons Toes and my kids just loved it. The show is about two hours long but it doesn’t seem like it. During this two hours you will experience live sword fights, real jousting, hand to hand combat, beautiful horses and even an awesome demonstration with a falcon. It’s a great experience for both kids and adults alike. So let’s talk about the knights! They are incredible and pretty easy on the eyes if I must say. Each colored section cheers for their particular knight during the events. If you knight happens to win he will then bring a single red flower which he kisses and throws out to one lucky audience member. One of those lucky girls just happened to be my daughter Aubrey. This was the highlight of the evening and made her cheer even louder for our black knight! We had a fantastic time and we will definitely be going back. You can purchase your tickets online and they even have a section for special offers so be sure to check that out. 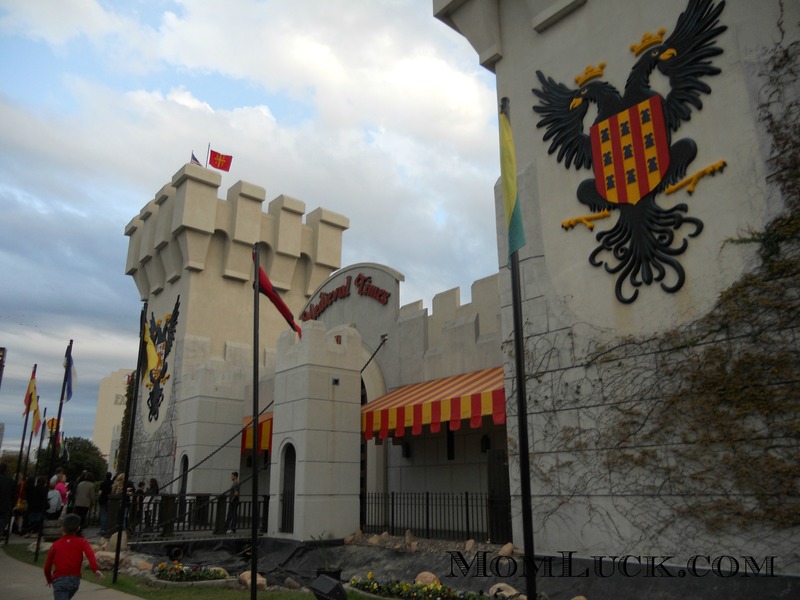 For more information on Medieval Times in Dallas as well as the other Castles around the US be sure to visit http://medievaltimes.com for more information. 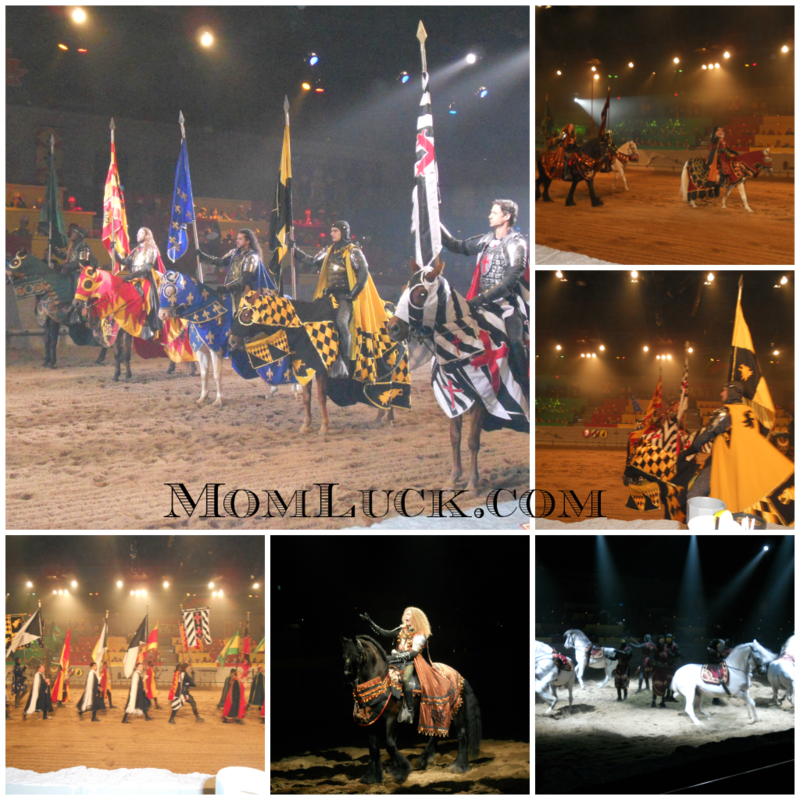 *Medieval Times provided tickets for my family and I to enjoy the show as part of the Family Travel Conference. All opinions expressed are 100% honest and my own. What a fun way to spend family time! I’m sure adults and kids alike would all have a blast. Love the building and the dinnerware, looks like fun. my boys want to go there so badly. We went to this show in Orlando and my boys loved every minute of it! sounds like a cool family event!! I love that she was one of the girls who got flowers! I’ve been there several times and love it every time. Plus the food is darn good! I’ve always wanted to go to Medieval Times! We don’t have any close to us–boo! The closest I’ve been is the Medieval dinner show at Excalibur in Vegas. One of these days! 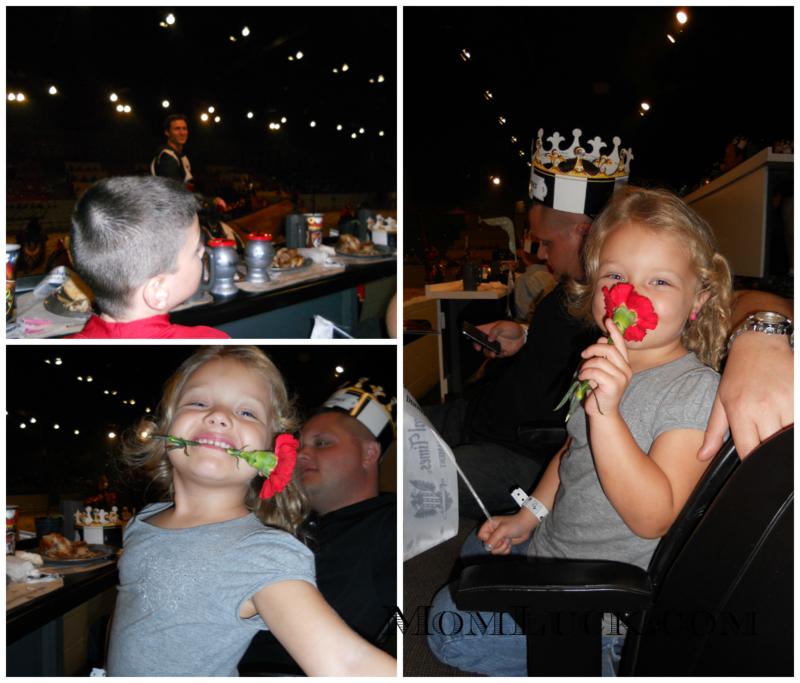 I love dinner shows, and I think Medieval times is one of my favorites! I’d love to go to something like that. Looks like fantastic fun! I want to go to this show in Orlando sometime. Sounds like y’all had a great time.